There are lots of benefits of playing guitar. The following are 10 of them. If you were considering picking up this instrument – or another instrument for that matter – but are still on the fence, hopefully this will give you all the motivation you need to get started. When you start to play guitar, you inevitably start to connect with and meet other guitarists and other musician’s. This might lead to just a few low key jam sessions, or even might just involve discussions with other musician’s – or it could lead to playing in a band, orchestra or other ensemble and create life-long friendships and often even to finding a life-long partner. O.k. I know there are times when you’re trying to learn something and you can’t seem to get it and that can be very frustrating – but the stress relieving benefits of playing guitar – particularly when you get in the flow, far outweigh those brief moments of frustration. Sometimes it just feels good to play guitar. In fact, some studies suggest that playing guitar, or another musical instrument can increase dopamine output – which makes you feel great. This is potentially part of the reason that it also helps to decrease stress. I sometimes find after playing guitar for a long period of time that I’m tired but relaxed and almost euphoric. 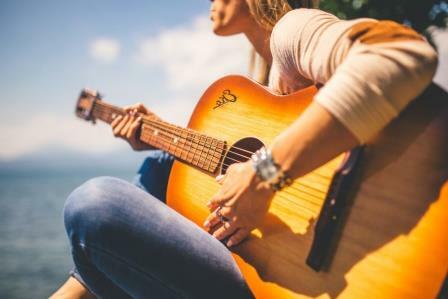 Studies have shown that learning the guitar, or other musical instrument, improves memory, ability to manage multiple tasks and in general improve brain sharpness. This is not only good for the present but can also help to reduce mental decline as you age. Sitting around and playing isn’t going to have you dropping pounds or give you ripped abs – but if you’re playing in a band or ensemble and you’re standing up it really does feel like a workout after a good jam session. Even sitting there and playing will do some good physically – both in terms of burning some energy and in terms of strengthening your wrists and fingers. I remember a friend of mine years ago who was into basketball. He couldn’t believe how easily I could palm the basketball in my left hand – despite having smaller hands than him – those strong guitar fingers were the key. There’s nothing like starting out having no clue of how to do something and then after putting in the time, effort and practice, being able to fluently play one of your favorite songs. You may or may not end up being in a highly popular band making gazillions in album sales. But even the most humble guitarist, once they have reached a certain level, can make money playing, whether that’s busking, playing in a small time band, playing for an orchestra, doing solo shows in a café, or playing at events such as weddings. And even if you don’t make any money playing guitar directly, the increased mental and psychological benefits will help you to perform better at any given task – which can help you to secure the job, promotion or business opportunity that you seek. If you are learning guitar properly, you are spending time practicing. But if you are like most people you don’t have 8 hours a day to practice. So, for your practice time to be effective, you’ll need to learn how to properly manage your time for the most quality practice sessions. This has benefits well beyond just learning guitar. As well as using organizational skills to help make your practices more efficient and effective, you are likely to use organizational skills to organize others, if you end up jamming with other musician’s, whether in a band, orchestra or just casually. Even as a solo artist, if you are playing gigs you’ll need to exercise those organizational and people management skills. Plain and simple learning guitar is fun. O.k. there are times when you’re struggling to learn something or when you’re playing scales over and over again, that it can feel like a chore. But for a majority of the time it’s just plain fun. Especially if you get involved with other musicians. There really is nothing like playing music with others, whether it’s jamming out some of your favorite songs or compositions or playing or creating your own original music. Well those are just a few of the great benefits for learning guitar. This is definitely not all of them. If you can think of any others that I haven’t mentioned here, feel free to add them in the comments section below. It was really nice how you explained that learning how to play the guitar will allow a person a sense of satisfaction because of the idea that they will start off not knowing anything and then with just a bit of time and effort, they will be able to play it properly. I guess a sense of satisfaction is included, but the reason why I want to play the guitar was the idea that I like a good challenge. I am planning to learn how to play musical instruments for the fun and challenge, and I will start off with a guitar. Thank you. Definitely fun and definitely challenging – but also satisfying (and even more fun) when you start to get more fluid. Keep up the hard work and the rewards will come! Thanks for your message and for visiting Six String Acoustic.